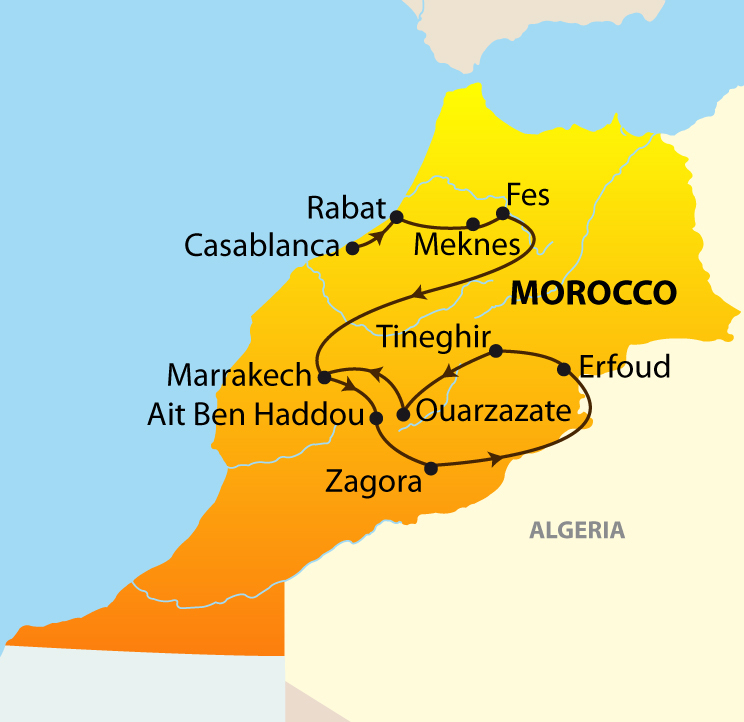 The High Atlas Mountains dramatically divide Morocco; its fertile farmland and most of its cities lying west towards the Atlantic while the great Sahara Desert spreads away to the east. And when it comes to scenery, think Lawrence of Arabia, filmed near Ouarzazate on the old caravan routes. Visit deep valleys filled with date palms and lush oases, see the sun rise over a sea of sand dunes at the edge of the desert, and picture yourself in a Kasbah (fortress) built in the days of the French Foreign Legion. Writers have rhapsodized about Morocco, painters have tried to capture its essence but only through the experience of travelling in this breathtaking country can you come to understand and appreciate its uniqueness. Add to all this superb food, enchanting hotels and warm, hospitable people and what you get is Morocco at its very best! Join on Sundays in Casablanca. Minimum 2 people traveling together throughout the tour. After and early breakfast and checkout of your hotel, you will be transferred to the airport for your onward flight. - Applicable local and government taxes on accommodation and transportation. - Tips and gratuities to driver, guide, hotel and restaurant staff, room service etc. - Items of a personal nature i.e., telephone/internet usage, laundry, bottled water and other alcoholic and non-alcoholic beverages, etc.